"U.S. Marines Personal Checks" product is already in your cart. Honor the United States Marine Corps with our U.S. Marines personal checks from Bank Checks Now. The United States Naval Marines are on call 24-7-365 with the ability to deploy into any hotspot in the world where needed. The Marines are one of the first military divisions deployed in any world crisis where interests of the United States are threatened or at stake. Enjoy images of World War 2 Marines raising the flag on-top of Mount Suribachi during the battle of Iwo Jima on February 23, 1945. Marine Veterans and others take pride in the Corps Globe and Anchor Insignia as displayed on one of these checks. Order your new Marine checks today and save money on your next order of new checks. Save up to 70% when compared to the high prices that banks charge for new checks and any re-orders. 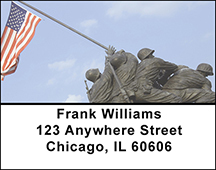 Complete your new U.S. Marines personal check order with matching address labels and a coordinating checkbook cover. Order Now!